Thank you Bubba Rafferty, Rick Sigman of Perfect Converter Co for bringing the Battle for the Benjamins to the racers of the RRA!! 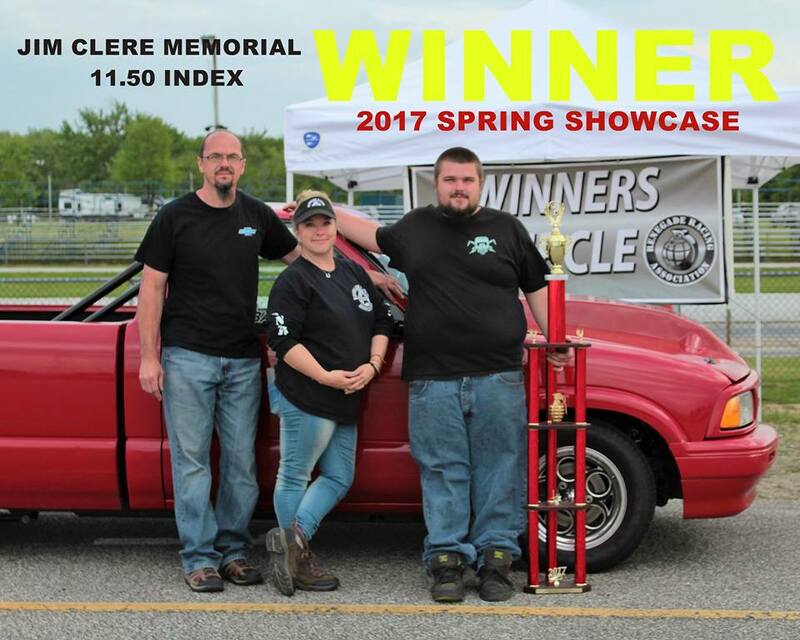 When the RRA took to the track in the Spring of 2016, the racers obviously had their sights set on their Class' Title but if they were to fall short there was still a Plan B. As long as they could hang on to one of the coveted Top 8 spots they had a shot at running in the 1st Ever Battle for the Benjamins presented by Perfect Converter Co!! A shot at the $1000 prize and to also be the last racer standing as the Champion of either the .400 or .500 portions of our program. The end of 2016 did not go as planned and the 1st time in our series 7 yr history we lost out on running our finale weekend. Fast Forward to Spring of 2017 and Mother Nature would once again force us to our knees bowing in defeat as we were forced to cancel our May 6th season opener. We were not going to give up on the Running of the Battle...not yet!! We would give it one more shot...that shot would come May 20, 2017!! A date she would threaten and even taunt us with a few random sprinkles but in the end she would show us mercy and the racers would finally go to Battle!! John Sahli, Bob Keaton and Clay Courson all earned a position in this all star showdown but unfortunately they would be kept from competing and alternates would be brought up in their place. We would go down to 12th place pulling up Jim Loveland to round out the field. On the other side of the ladder, Jack Brown, Brad Courson and Darrin Sotera would all miss the call and were replaced by alternates, this time we would go all the way down to the 15th position pulling up Dennis Chillik before the ladders were officially set. Plagued with some mechanical issues our 2016 Class Champion Eric Tuuri would not make it passed the 1st round of competition. 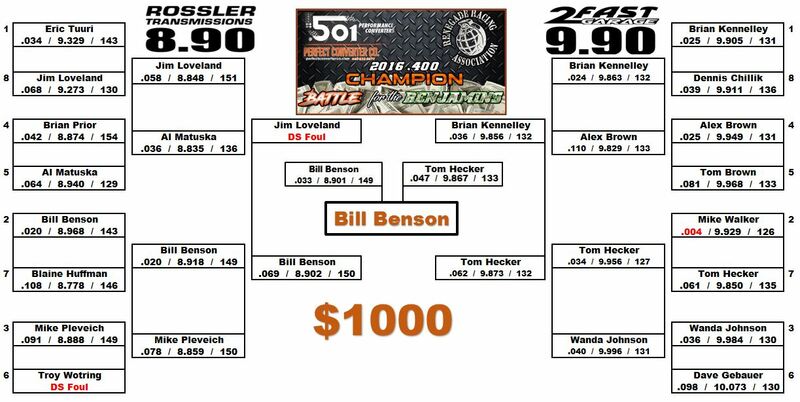 Jim Loveland the 12th place alternate would face 2nd place finisher, Bill Benson, in the finals. Unfortunately for Jim he would fall victim to the dreaded Deep Stage Disqualification sending Bill to face his 9.90 opponent in our 1st ever open comp finale. Brian Kennelley, the 2 time 9.90 Champion, would make it as far as the finals where he would find himself on the wrong side of a double break out round against 2016 Rookie to the RRA, Tom Hecker, who also came into the event as an alternate. 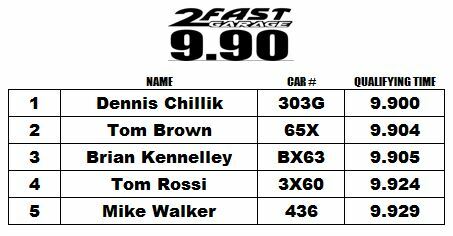 Bill Benson slowly reigned that car in all day putting up back to back 8.90 passes. First in the 8.90 final and then against Hecker in the .400 Battle for the Benjamins Finale to take the win and claim the title. We had the complete opposite on the .500 side of things, all of the alternates were left on the outside looking in!! Every racer who claimed one of those coveted spots was in attendance and ready to fight for the $$$ and the title!! 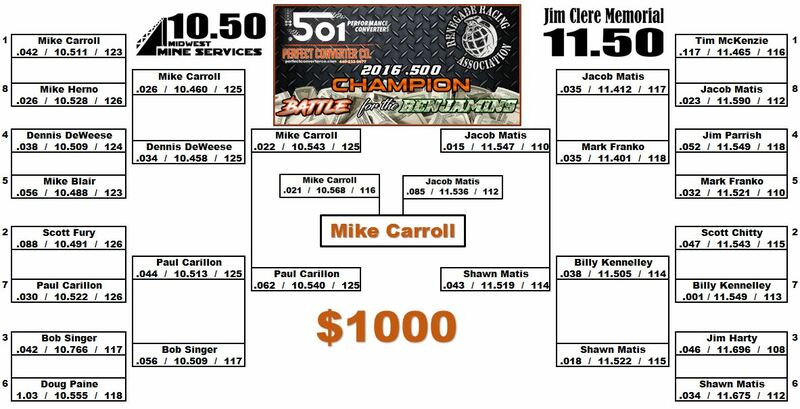 Mike Carroll, the nonconsecutive 3 time 10.50 Champion would make his way to the 10.50 final to face Paul Carillon. Mike's advantage off the line would get him the win and the shot at moving on to the .500 Finale. Last years Champion, Tim McKenzie would fall in the 1st round to Jacob Matis who would go on to face his father, Shawn Matis in the 11.50 final. This father/son matchup was exciting to watch and a mere .0002 being all that separated Jacob and Shawn!! Jacob would once again oust his father to move on and face Carroll in the .500 Finale. Jacob was a little late on the tree and couldn't overcome the deficit at the top end. Mike Carroll would become the 1st ever Battle for the Benjamins .500 Champion but also keep his streak alive when it comes to RRA allstar event wins. CONGRATS TO MIKE CARROLL AND CREW!!! All new in 2017 was the Spring Showcase...it was a huge success!! Kicking off our 8th season with our 2nd highest car count ever with 83 Entries into the event. This was event was born out of necessity and even though it will be run differently next year it will hopefully become part of tradition in the years to come!! Because of the Battle we decided to run TnT/Qualifying with a twist. 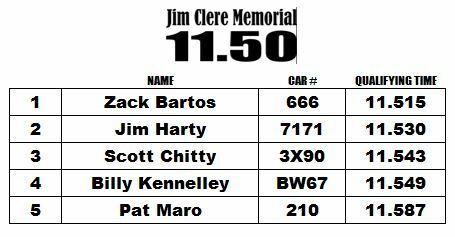 #1 for the day would be crowned the Winner and take home the trophies that were courtesy of the sponsors behind the Jim Clere Memorial 11.50 Index Class!! Points racers received 60 Entry Points and top 5 finishers received bonus points. I will list the top 5 qualifiers in each class. 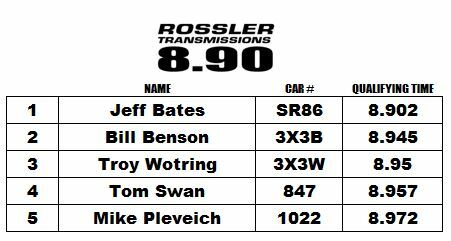 The Rossler Transmissions 8.90 Index Class had a strong showing of 16 cars entered in the event!! Some may say it was beginners luck but it seems to almost more of a tradition vs coincidence among some of the Rookies of the RRA to claim the #1 spot in their 1st outings. Jeff Bates has been following the RRA for the past couple years but was able to officially join us this season, it will be exciting to see what the season brings for this newcomer to the series!! 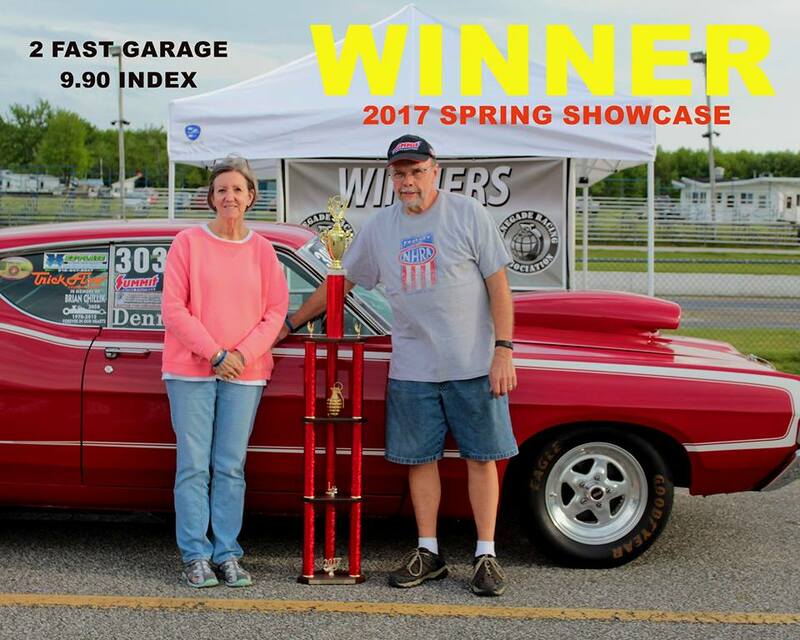 2 FAST GARAGE 9.90 INDEX CLASS HAD 18 RACERS ENTERED INTO THE EVENT!! Dennis Chillik and his wife Carol just celebrated their 50th Wedding Anniversary on May 6th, we hoped to celebrate the day with them but as we already established Mother Nature had other plans. Their 1st time out to the track the racer who I believe to be the patriarch of the 9.90 Class, led by example and showed all those boys (and girl) how its done!! Perfect 9.900 to claim the event win and start the season on top of the points standings!! 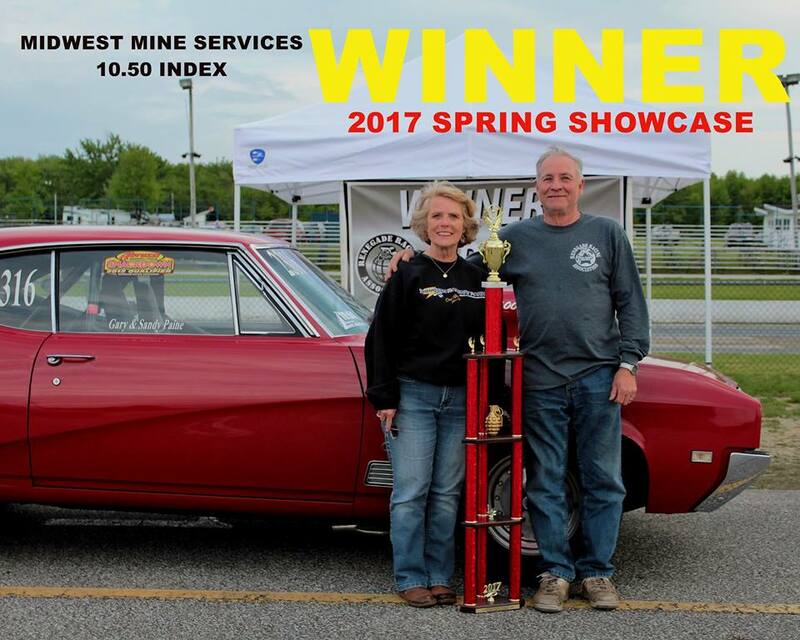 MIDWEST MINE SERVICES 10.50 INDEX CLASS LEADS THE PACK WITH 27 ENTRIES!! Gary Paine is yet another racer proving age is just a number, only numbers that counts on race day are the ones you put up on the board!! 10.50 has been said to be and often proven to be the toughest class within all of the RRA...especially when it comes to qualifying!! Not the 1st time Gary has bested the competition when multiple 10.50 passes were put up. 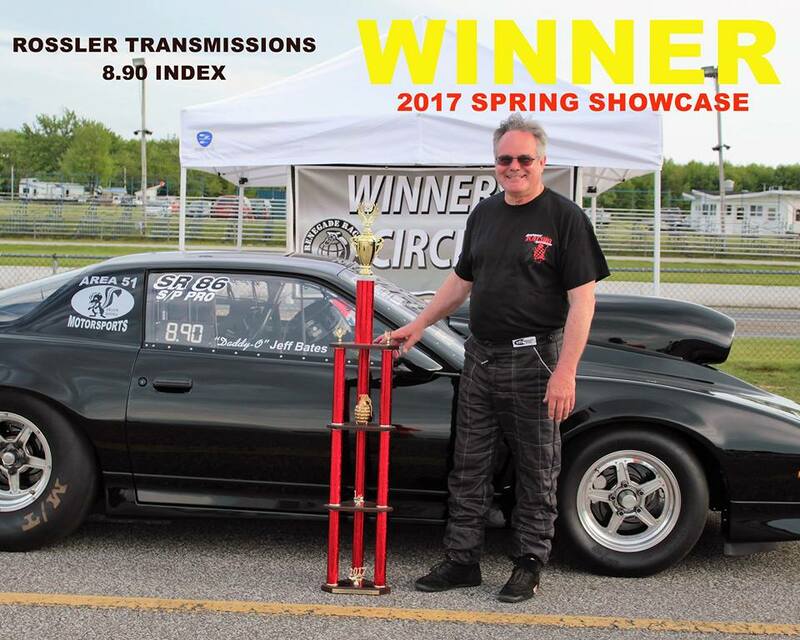 Great job on taking home the trophy, bragging rights and the points lead going into the 1st officially eliminations event of the 2017 Season. JIM CLERE MEMORIAL 11.50 INDEX CLASS REPRESENTED NICELY WITH 21 ENTRIES!! Seems every season the excitement of one of the Rookies to the RRA catches our eye and reminds us of what we can begin to take for granted. Few years ago that Rookie was Zack Bartos, and even after the week from hell that smile had returned on Saturday!! Zack had plans to step up through the ranks this season but sadly the motor in his other truck would decide otherwise. Instead of throwing in the towel Zack made peace with the fact that he was running 11.50 for at least one more year. He went home readied his old truck came out swinging. He claimed that top spot right out of the gate and held onto it, taking home the trophy and the lead in the 11.50 Championship Chase!! MIKE BROWN CUSTOMS OUTLAW LIMITED STREET CLASS! !